First tip; never add salt to cooking beans, don't know the reason but if you do add salt the beans never get done all the way, could be a reason for your crunch. 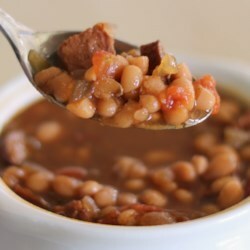 My mother made the best bean soup ever and she always started with leftover ham bone (flavor is in the bone) also believe it or not at the very end of making the soup ....for a large pot of soup add 3-4 tbl. of cider vinegar. People will have NO idea what's different but it does give the soup more flavor. Good luck. Hope I helped.